Over the weekend, I had planned to see ‘The Mayor of Casterbridge‘, based on the tragic novel by Thomas Hardy and set in a fictional rustic England. But all of a sudden, changed mind to watch BBC documentary “Earth Pilgrim”. This exquisitely photographed film is a meditation on the moor that follows in the footsteps of Satish Kumar, a renowned ecologist and pilgrim for peace. In the documentary, I found his lyrical and timely observations illuminating the sacred beauty of the wildlife, forests and rivers of Dartmoor. 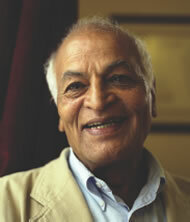 It was in 2008 when Satish presented his 50-minute programme on the BBC as part of the Natural World series. A highly acclaimed documentary that mixed eastern philosophy with the western landscape of Dartmoor; the programme was claimed to have been watched by over 3.6 million people. In this, Satish reflects on our connection to the natural environment. Using the traditional English landscape of Dartmoor as his natural muse, he offers a very Indian perspective through the changing seasons. Through the film, he introduces the Dartmoor scenes and sights that most inspire him – gnarled oak woods, whirling starlings, rushing rivers, stags in rut, wild tracts of heather, cuckoos hungry for food, the metamorphosis of moths – and contemplates what they reveal, and the lessons they hold for humanity. Inspired by Mahatma Gandhi, Satish’s opinions may well be considered for being part of our school syllabus and national policy. Because Barack Obama may have got the Nobel for Peace, but the beautiful explanations rendered flawlessly by Satish in his “Earth Pilgrim” have the potential to be converted into a campaign to strip the ambitious Honolulu boy off the Nobel Peace chair. 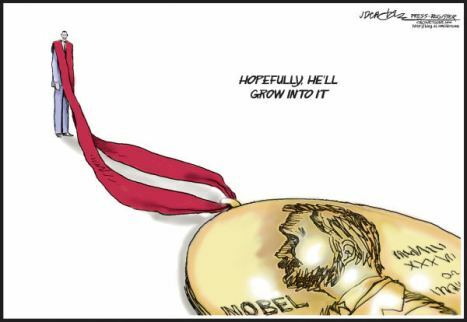 One of the many Nobel cartoons on Obama. True, in the words of Gandhi, with which the documentary also ends, Obama must first become the change he wants to see in the world. As, till date, though claiming himself to be the world leader and being acclaimed as the most powerful man on earth, the US President has not taken any test, what to talk of clearing any, to prove his credentials for the Nobel Peace Prize. And let’s not forget Obama was elected as the US President on a message most succinctly defined by a single word: ‘change’. Where is that? Excellent, EXCELLENT article. You really open my eyes here – and I love your style, very readable. Thanks again. You are welcome.